Home › Comic › Special thanks. I wanted to thank everyone who made this comic possible. 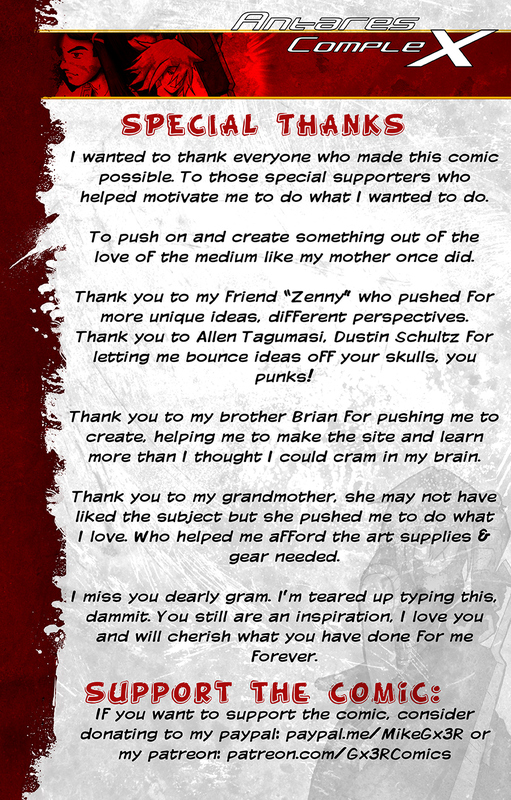 To those special supporters who helped motivate me to do what I wanted to do. To push on and create something out of the love of the medium like my mother once did. Thank you to my friend “Zenny” who pushed for more unique ideas, different perspectives. Thank you to Allen Tagumasi, Dustin Schultz for letting me bounce ideas off your skulls, you punks! Thank you to my brother Brian for pushing me to create, helping me to make the site and learn more than I thought I could cram in my brain. Thank you to my grandmother, she may not have liked the subject but she pushed me to do what I love. Who helped me afford the art supplies & gear needed. I miss you dearly gram. I’m teared up typing this, dammit. You still are an inspiration, I love you and will cherish what you have done for me forever. Please consider supporting the comic with the links below, your name will go on the donator wall and be added to the current issue’s donation page (unless you request to remain anonymous or use a nick name).